Southern senior Jensen Anderson chips in for birdie on the par-4 second hold at Riverside Golf Club, during a TVC Hocking match on Wednesday in Mason, W.Va.
South Gallia’s Nolan Stanley putts onto the second green at Riverside Golf Club, during Wednesday’s TVC Hocking match in Mason, W.Va.
MASON, W.Va. — Home course, defended. 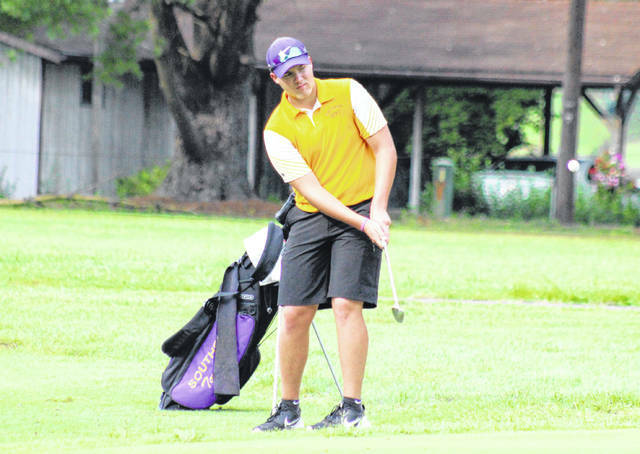 The host Southern golf team claimed victory the rest of the Tri-Valley Conference Hocking Division, split evenly between Tuesday and Wednesday nights at Riverside Golf Club, putting the Tornadoes in sole possession of first place in the nine-team league. On Tuesday, Southern fired a team total of 167, in the play six, count four format. Belpre was runner-up with a 194, Waterford was third with a 197, followed by Wahama with a 210. Trimble was unable to post a team score. Jarrett Hupp led the Purple and Gold with a 6-over par 41. Southern’s next three scores were all 7-over par rounds of 42, recorded by Ryan Acree, Joey Weaver, and Landen Hill. The non-counting scores for the Tornadoes were a 43 by Jensen Anderson and a 57 by Will Wickline. Ethan Mitchell led the White Falcons with an 11-over par 46. Gage Smith was three shots back with a 49, followed by Ty White with a 57 and Casey Greer with a 58. Wahama’s extra scores were a 59 by Mattie Ohlinger and a 61 by Isaac Roush. Belpre’s Eric Dotson was Tuesday’s medalist, recording a 4-over par 39, one stroke ahead of Waterford’s Wesley Jenkins. Trimble was led by Zach Bragg with a 56. On Wednesday, The Tornado total was a 169. Eastern — which entered the match tied for first in the league with SHS — was second with a 180, 23 strokes ahead of third place Miller. Federal Hocking’s total was a 219, while South Gallia failed to record a team score. Acree earned medalist honors for the Tornadoes, firing a 2-over par 37. Hupp was next for Southern with a 43, followed by Anderson with a 44, and Weaver with a 45. Hill and Tanner Lisle each had rounds of 52 as extra scores for SHS. The Eagles were led by Ryan Harbour with a 4-over par 39. Next for EHS was Kylee Tolliver with a 44, followed by Jasiah Brewer with a 48 and John Harris with a 49. Ethan Short’s 51 and Nick Durst’s 54 were Eastern’s non-counting scores. 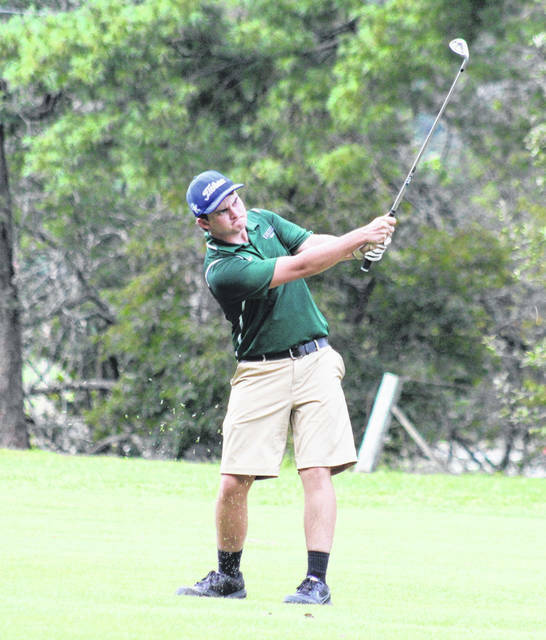 The two Rebels competing were Nolan Stanley and Sam Cudd, who recorded rounds of 69 and 70 respectively. Hunter Dutiel led Miller with a 39, while Mitchell Roush paced the Lancers with a 48. 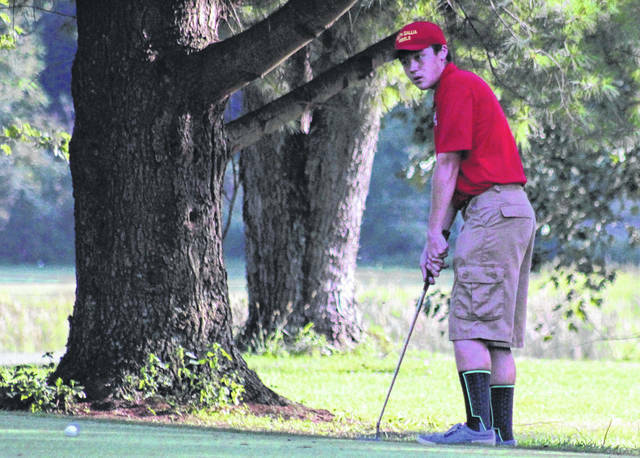 Eastern and Wahama returned to action on Thursday at the Meigs Golf Course, where South Gallia and Southern will play their next round the following Monday.